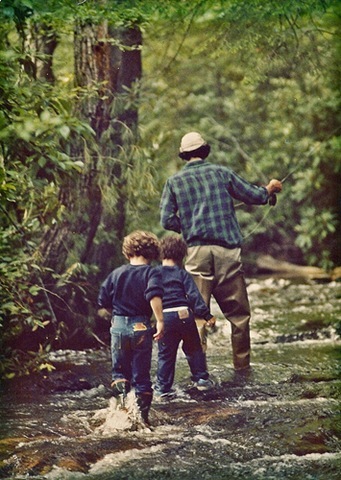 I’ve always loved this picture of my father, brother, and me ambling upstream on the East Fork of the Chattooga River. Since the early 80’s it has sat steadfast upon my Dad’s bureau, and only until now have I been able to obtain a digital image of it. Having recently become a new father, this picture offers renewed significance. Like fly fishing, parenting requires patience and timing, keen observation, and trial and error. And whether or not the right balance is achieved, there is inevitably some form of personal discovery and reward. Never exercised the plastic filter in Photoshop until now, but I think it works in this case. And if you were wondering, the model is far from plastic. I recently turned 34, and this is where I found myself. It has been an awfully long time between posts, but the slings and arrows of work and life have had my typing fingers focused on other items. However, these same hands did manage to steer me in the direction of Cashiers, North Carolina this past weekend for a long overdue visit to a very special place I first came to know as a small child. Despite the fact that the southeast is experiencing a drought of which I have not seen in my lifetime, the fall colors were still quite beautiful, and it was invigorating to get out on the trail and do some exploring. I took a walk down memory lane by choosing to do the Chimney Top Trail that starts right out of High Hampton. I used to do this trail quite frequently with my parents, so it was nice to reflect upon those simpler times. Instead of the pungent smell of sagebrush that I grew accustomed to living out west for almost ten years, my nose was greeted with the deep organic smell that is indicative of the Appalachian Mountains. It is said that the Appalachian Mountains are the oldest in the world, so needless to say they have had adequate enough time to develop their fine vintage aroma. The trail is a mere 1.6 miles with a little scrambling across some granite faces at the top. The views are subtle and beautiful, and the whole jaunt makes for a relaxing day. Best of all, if you are in the area during peak fall season you’ll find that this path is far less traveled by.